In a decision that is bound to strain revenues of telecom operators in the country, the Union Cabinet today cleared charging of one-time fee for the excess Spectrum held by incumbent operators. The decision is likely to bring in around Rs 31,000 crore to the national exchequer. Having secured unequivocal support of Congress president Sonia Gandhi for his reform measures, Prime Minister Manmohan Singh will explain the rationale behind the UPA government�s recent decisions to the party�s top leaders tomorrow. The move aims at enabling them to dispel misgivings about the adverse impact of these policies. Days after Delhi blamed the northern states, particularly Punjab, for the choking smog hanging over Delhi's sky, the Punjab Government on Thursday strongly refuted the "unsubstantiated allegation". 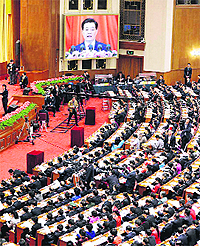 China today began the process of its once-in-a-decade leadership change, with a stern warning from outgoing President Hu Jintao that corruption in the ruling Communist Party could prove �fatal� to its 63-year-long grip over the country. The Punjab Government today made anxious attempts to defend Rs 1-crore donation by Deputy Chief Minister Sukhbir Singh Badal to his alma mater (Lawrence School, Sanawar) by questioning powers of the courts to decide whether the grant was given for a public purpose. The move comes after the state government conceded a week ago that the donation was not strictly within the ambit of the Punjab Nirman Programme. The installation of mobile phone jammers by the SGPC in the sanctum sanctorum of the Golden Temple has ringed in good news for those seeking solace in the serene environs of Harmandar Sahib. The move is aimed at preventing cell phone users from disturbing the tranquillity of the Sikh shrine. 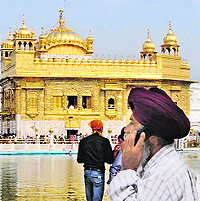 A devotee talks on cellphone on the Golden Temple premises.